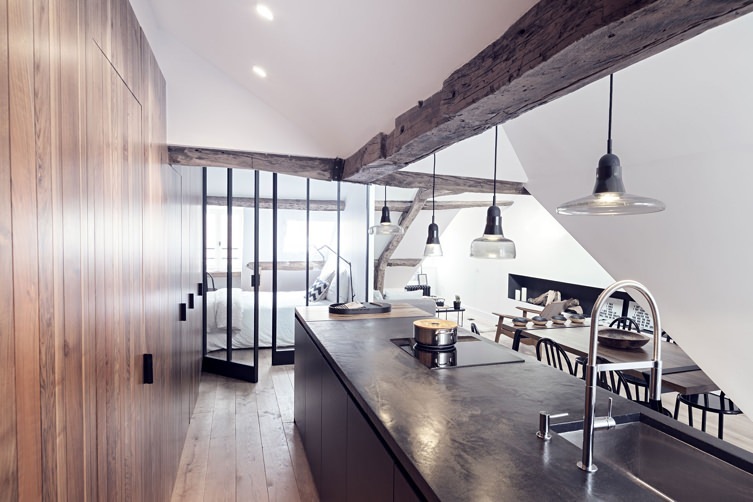 Interior Inspiration: This Parisian Apartment Expertly Blends Old and New | Valet. You've got to hand it to the visionary designers who turned a dusty attic into this sharp, smart living space. 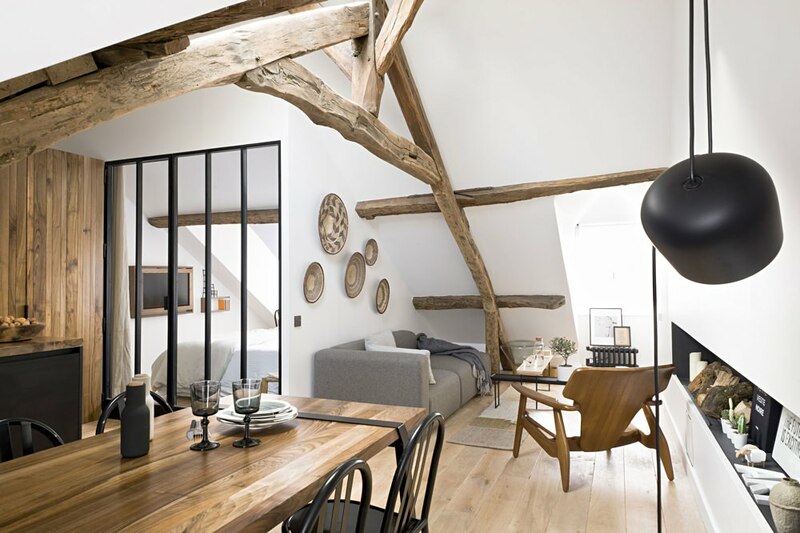 Located at the top of an 18th-century building in Paris' hip and historic Le Marais district, the finished apartment doesn't shy away from embracing what some might consider flaws. A clean, neutral palette showcases both original features like the natural wood rafters along with such modern additions as the steel and glass room divider. Herewith, a few lessons to take away from this unique and inspiring home. Keeping the clutter at bay is an easy way to make a smaller place seem larger. Much of this apartment's storage (along with the laundry and bathroom) is cleverly tucked behind a sleek wall of walnut paneling. A flat painting or photograph will always look great. 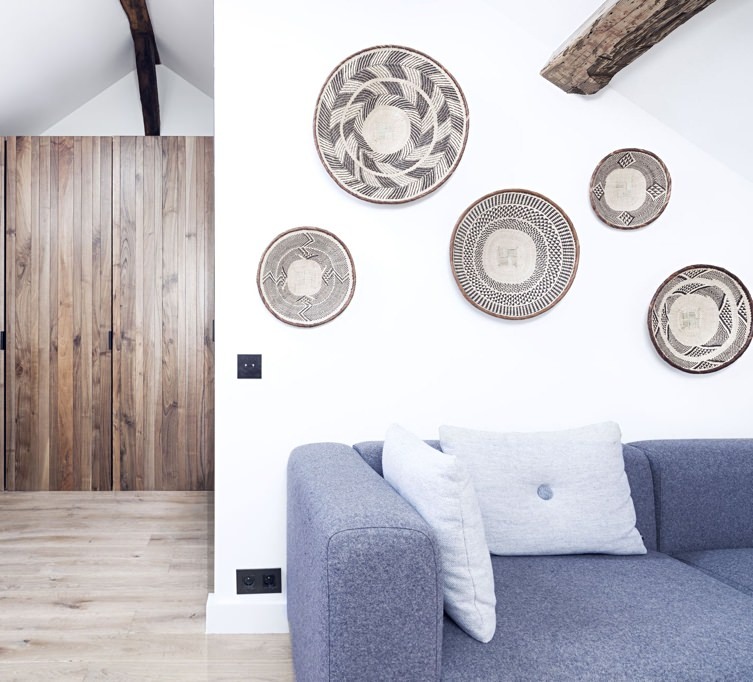 But when you've got limited area, mounting more 3-dimensional items (like these baskets) on the wall offers a nice pop of texture and gives even a sparsely decorated room a more fully furnished look. The designer carved out a small bedroom, nestled into one corner along the pitched roof. This didn't leave much floor space, so shelving and the television are mounted and framed to maximize space and style. 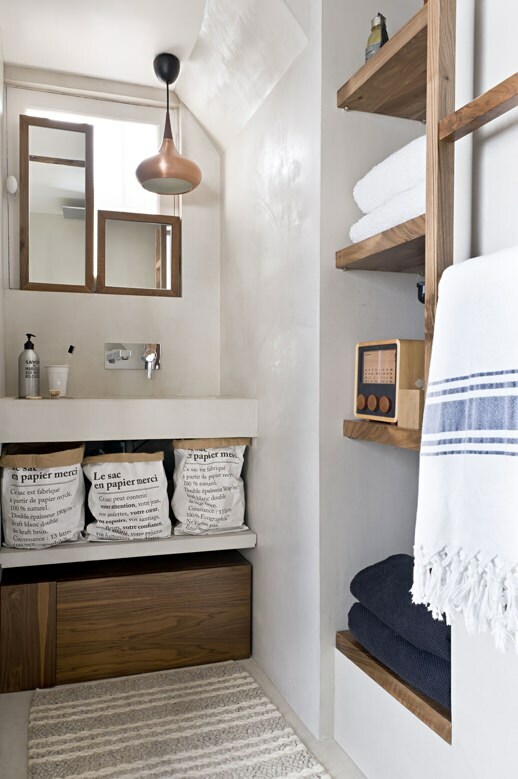 Going with a warm, monochromatic palette and open shelving ensures that this small bathroom doesn't feel too claustrophobic. And keeping the accessories and furnishings to a minimum avoids unnecessary counter crowding.